The face that runs the place and the new WWE World Champion, AJ Styles, heads to the ring. Styles reminds everyone that he has done exactly what he said he would do. His lips don’t lie, and the title belt is the proof. As he announces that he is “the champ that runs the camp,” John Cena heads to the ring. John Cena wants back what is his, so Styles tosses him the Cena headband he’s been wearing. Cena clarifies that he wants the title belt and quotes Ric Flair on his way to explaining that he wants to be a 16 time champ. That’s when Dean Ambrose heads to the ring. Ambrose is not happy. He ignores Cena and accuses Styles of stealing from him. Cena gets in Ambrose’s face and says he has no balls. Ambrose doesn’t care what Cena thinks. He calls Cena a “lazy part-timer.” He says Cena can’t keep up anymore. That’s when Shane McMahon heads to the ring. Shane compliments Styles but says that his “face that runs the place” stuff is annoying. He accuses Styles of taking the easy way out in his match with Ambrose. He then announces that Styles will be defending his title at No Mercy in a triple threat match against Cena and Ambrose. But tonight, Cena and Ambrose will team up against Styles and a partner of his choosing. Quick match, very dominant by the Usos. The point of this was just to give the Usos momentum with their new attitude. Stop signs say please and thank you to Curt Hawkins. Curt Hawkins has been known to scare clocks into ticking counter-clockwise. The Miz and Maryse head to the ring. Miz talks about being called a coward. He also talks about making the IC Title prestigious. Dolph Ziggler heads to the ring and says that the WWE Universe will never see Miz as a top guy. Miz says he doesn’t care about the approval of the fans. Ziggler challenges Miz to one more match with no shenanigans. Daniel Bryan then comes out and says Maryse is the only reason Miz is still champ and that Ziggler will get a rematch. Miz disagrees and reminds Daniel that he wants to renegotiate his contract. He holds the IC Title hostage until his contract demands are met. Styles asks Baron Corbin to team up tonight, but Corbin says he would rather fight Styles for the title. Then Corbin walks away. Baron Corbin is already in the ring for a match. Apollo Crews heads to the ring, but before the bell rings Corbin attacks Crews and gives him End of Days on the floor. As Corbin celebrates, Jack Swagger heads to the ring. Corbin wants no part of Swagger and walks away. 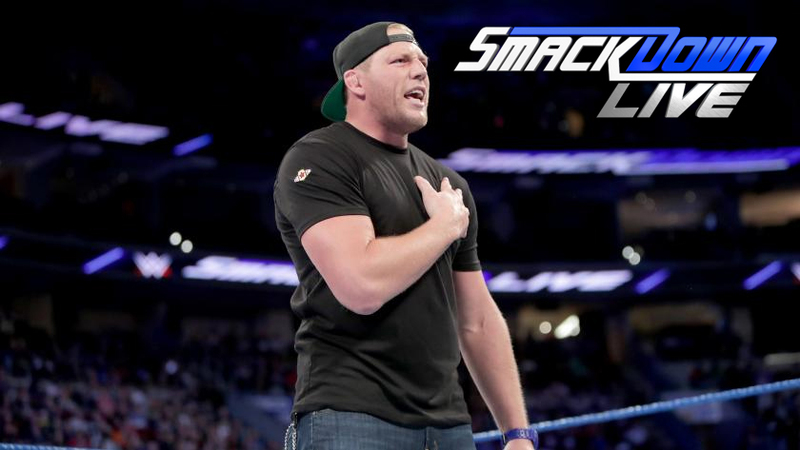 Swagger then gets on the mic and announces that he is now a member of the Smackdown roster. He says he going to be a “big problem” on Smackdown. Becky Lynch heads to the ring. Charly Caruso asks Becky how she feels being the first Smackdown Women’s Champ. Becky is very happy. She is also ready for whoever wants to challenge her. Pretty good match. I liked Alexa’s actions, but Naomi probably looked the best in the match. The best move was when Alexa was setting Natalya up for a sunset flip but Naomi hit a step-up enziguri on Alexa. Unfortunately naomi was involved in a fairly awkward moment with Natalya right after that. Besides that one moment, it was a good match. AJ Styles looks frustrated. He approaches Kane and asks him to team up. Kane just laughs and walks away. Already in the ring, Shane McMahon introduces Heath Slater. Along with Rhyno, Slater heads to the ring. Slater signs his contract and becomes an official member of the Smackdown roster. Slater thanks Shane, Daniel, his wife Beulah, Rhyno, and all of his kids. As his naming each of his kids, The Ascension heads to the ring. This was a very quick match. Not much to it other than Slater being in trouble and Rhyno being dominant. Daniel Bryan asks AJ Styles if he’s found a partner. He hasn’t, so Daniel says that James Ellsworth will be Styles’ partner. Styles is not pleased. Randy Orton heads to the ring. He addresses Bray Wyatt, telling Bray that he is afraid. He challenges Bray to head to the ring and face his fear. Bray appears on the Tron and tells Orton that he gave him a way out. Bray knows what he must do. He warns Orton to “not sleep.” Bray then appears at ringside. The lights go out, and when they come back up Erick Rowan is in the ring. Rowan attacks Orton but quickly takes an RKO. AJ Styles heads to the ring for the main event. James Ellsworth comes out next, but he’s quickly and brutally attacked by The Miz. Apparently The Miz is upset that he isn’t in the main event, so he will partner with Styles. Cena and Ambrose then come out for the match. A good match. I liked that Ambrose refused to tag Cena for a long time, but their inability to work together didn’t seem to make much of a difference. After the match, Ambrose hits Dirty Deeds on Cena. I suppose the show was entertaining enough, but there was way too much talking and not enough wrestling. The women’s match and the main event were longer than the other two matches, but they were still pretty short. They could have easily fit another match on the show or gave more time to the matches they already had. It wasn’t fantastic, but it was the best of the night. The momentary awkwardness in the women’s match and the extremely short length of the other two matches make the main event win by default this week.